TRANSPONDERS MADE FOR ALMOST ALL CARS AT LOW LOW PRICES!!!!!!!!! 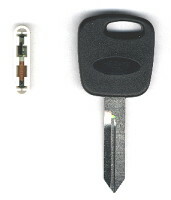 Well, a transponder has a small tube or chip inserted into the head of the key. It sends off a signal like a radio transmission. ( an rf gain signal) this signal acts like a number code and there are millions of different possibilities. Every transponder made has a different number it puts out, you must make your car learn to accept another number into its security system to make the key work. HOW DO I MAKE A KEY WORK? Well, for some cars it can be very very simple some cars though must be hooked up to very expensive hand held computers and interfaced with. You should call and ask because there is a good chance you can make another key very very cheap.